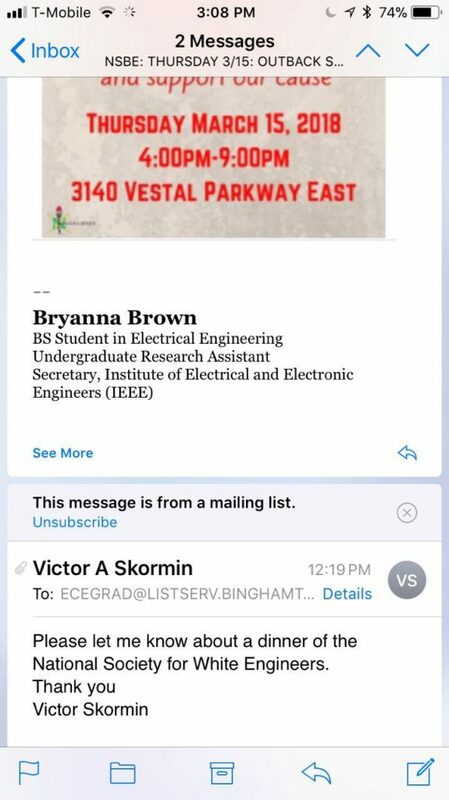 Everybody on the electrical and computer engineering graduate Listserv got an email Wednesday morning promoting the National Society of Black Engineer’s club fundraiser at Outback Steakhouse. Everybody on the Listserv also got professor Victor Skormin’s response. The email has since been called inappropriate by Binghamton University students, faculty and administration. Douglas Summerville, professor and chair of the computer and electrical engineering department, sent an email at 3 p.m. on the same day to students in the electrical and computer engineering program. Although the email did not address Skormin, a distinguished service professor of electrical and computer engineering, by name, it said his language is not representative of the department. BU President Harvey Stenger and Provost Donald Nieman issued a joint statement on Thursday condemning Skormin’s comment and voicing their support for NSBE. “Clearly, this is neither the level of professionalism that we expect from members of the Binghamton University community nor is it compatible with the University’s commitment to diversity and inclusion,” the statement read. In his email, Summerville stressed that the department is taking steps to ensure that this will not happen again. Many, however, feel that this incident is not isolated. While she was taken aback by the comment, Siaki Tetteh-Nartey, a member of NSBE and a senior majoring in computer engineering, said she was not surprised to see inappropriate language coming from a professor. According to Tetteh-Nartey, organizations like NSBE were created in response to exclusion in the engineering community. This semester, Skormin is the only professor teaching EECE 361: Control Systems, which is a major requirement for students majoring in electrical engineering, and EECE 517: Adaptive Control Systems. He is set to retire next year. According to Anna Domagala, a senior majoring in electrical engineering and former student of Skormin’s, the professor is known for intermittently discussing his conservative values in class, particularly on issues like President Donald Trump and minorities in the United States. He also remarked on the nature of his humor, which he said is meant to increase students’ attentiveness in class. While many students have called for Skormin to be fired, Tetteh-Nartey said coordinating a conversation between the professor and his supervisors on race and appropriateness might be more productive. “If he gets fired, he gets scorned by a ‘hyper-politically correct university’ and he just has his bias, he’s going to continue on,” Tetteh-Nartey said.